Hans Christian Andersen wrote a fable about weavers who promised their emperor a new suit of clothes. The clothes were said to be invisible only to those who were stupid, incompetent, or of lesser rank. When the emperor displayed his new wardrobe, only a young child could see the reality: “He isn't wearing anything at all!" Most of us who are fully engaged in our day-to-day activities also lack the perspective to be able to assess what we actually see. We are too close to the situation. That applies to both work and play within our extended communities. At times, we can be as myopic as the emperor’s subjects. Jean Marie Laskas has written a book that will open the eyes of millions of American sports fans to the toll in broken lives and early deaths caused by football. We love our national game and praise those who excel at playing it. A few extremely talented athletes play the game at the highest level—the National Football League. Perhaps a third of those who play in the National Football League will suffer from chronic traumatic encephalopathy, a progressive degenerative disease found in people with a history of repetitive brain trauma. Because they suffer this mental and emotional deterioration after they retire, out of the limelight of Sunday afternoon they are as invisible as the emperor’s clothes. All of this changed as a result of the work of a young doctor from Nigeria, Bennet Omalu, who came to the United States to fulfill the hopes and dreams of his father. Omalu did not seek fame. In fact, he had never heard of American football. He did seek medical answers, however, when, while working in the coroner’s office in Pittsburgh he was asked to study the brain of “Iron Mike” Webster, the Hall of Fame center for the Steelers during their championship years. A beloved figure in Pittsburgh, Webster had suffered from severe amnesia, dementia and depression after leaving the game. He died at age 50. What Omalu found studying Webster’s brain changed sports history. Everyone knows that football is a collision sport. In fact, that is part of its attraction. On every play, large men batter each other. Some will suffer concussions, but all will experience thousands of sub-concussive injuries that accumulate over time. The brain never recovers. Bennet Omalu’s findings were ignored and later denounced by the only entity that could save the players from CTE—the National Football League. The NFL had spent years successfully crushing any independent study of the traumatic effects of playing the game. Forming its own committee of medical professionals who were already co-opted, the League repeatedly denied what appeared obvious to Omalu. Football as played in the National Football League was slowly killing those who had played the game. Laskas’s book tells Omalu’s personal story—first growing up in Nigeria and then as a young doctor in America. Based on extensive interviews, she offers the reader Omalu’s own thoughts as he navigated a strange land as a true outsider: African, young, and naïve. He published his work in scientific journals until the NFL used its influence to stop other medical professionals from learning what Omalu had found. By controlling the narrative, the NFL sought to preserve its profitable enterprise. Ultimately, it was personal injury lawyers who brought the NFL to justice by filing a class action lawsuit against the League on behalf of thousands of retired players, ultimately leading to a settlement of over a billion dollars. The National Football League no longer promotes violence as its primary product. The rules of the game have been adjusted to penalize players for engaging in the highest risk activities. The game has been made safer, but it can never be made entirely safe and still maintain its hold on its passionate fans. 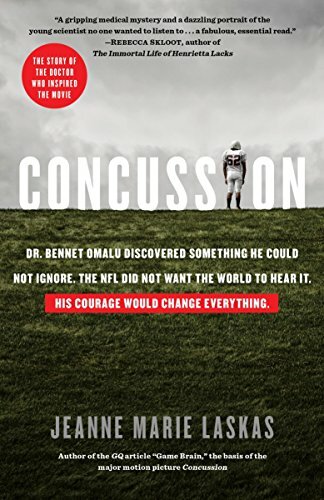 Moreover, the remarkable story of Bennet Omalu will not attract others to criticize the NFL. If you play with the tiger, you will be bitten. Laskas’s book has been made into a movie starring Will Smith as the Nigerian doctor. Unable to stop its release, the NFL has geared up its public relations juggernaut to deal once again with the fallout. Bennet Omalu will receive the credit he deserves for telling us that the king has no clothes. What those who love America’s game will have to decide is whether we can continue to enjoy the contests that draw the lifeblood from the combatants.